Sunny along with a few clouds. High 61F. NW winds shifting to E at 10 to 15 mph.. Partly cloudy skies in the evening, then becoming cloudy overnight. Slight chance of a rain shower. Low 46F. Winds S at 5 to 10 mph. Milton junior Myles McDermott would not be stopped. The Milton team bus pulled out of the Brockton High School parking lot, and the players and cheerleaders could not contain themselves. The basketball players led the chant: “We are the Wildcats! We are the Wildcats!” and it could be heard all the way down Route 24 back to Milton High School. Coach Sean LoPresti could be seen bowing his head with his eyes closed, most certainty reflecting on what had to be one of the most exciting comebacks he has coached. 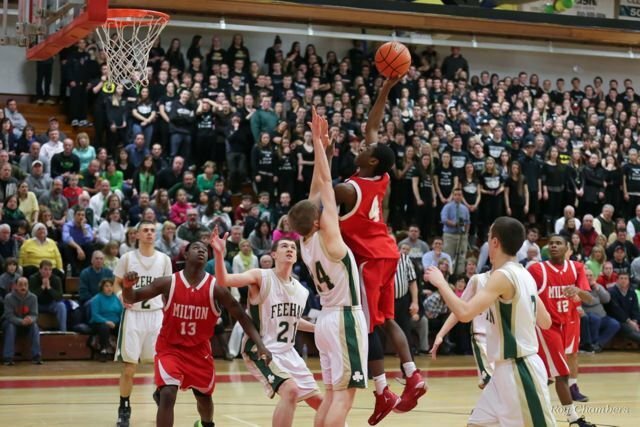 The Milton Wildcats had just beaten Bishop Feehan 79-75. The Bishop Feehan Shamrocks came into the semi-finals of the MIAA Boys Basketball South Division II Tournament as the No. 1 seed with an impressive 19-1 record. So it was not a surprise to many when they took a 39-29 lead into the locker room at the half at the Brockton Boxers Field House. At the start of the second half the Shamrocks dropped in a couple of 3-pointers, and it started to look like they were going to pull away with the game. Milton players Juwan Gooding, Keyon Jones and Myles McDermott could be seen shaking each other and expressing concern. The Milton Red Nation was cheering, reminding them they were there with their support. The Wildcats started chipping away at the Shamrock lead, and with 6:13 left in the fourth period Milton had pulled ahead 59-58. The Wildcats defense was relentless on the Shamrock offense, not letting them get off any 3-point shots. In the final period the Wildcats would score 31 points to take home the win. Keyon Jones led the scoring with 31 points in the game, while Myles McDermott had 15 points and Juwan Gooding got 12 points. 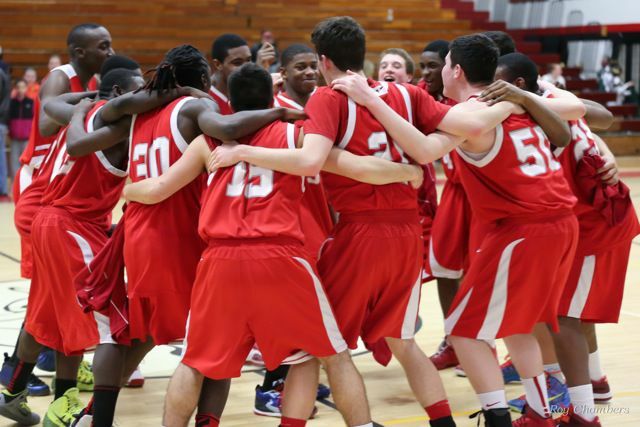 Next up for the Wildcats will be the winner of the Walpole–Sharon game on Wednesday evening, March 6. The MIAA South Division II Championship Game will be played at UMass Boston on Saturday, March 8. Photos by Roy Chambers. Visit MiltonSports.com for high quality versions.